Peace treaties regularly have clauses about types or groups of weapons in them, be they tanks, chemical weapons, etc. To my knowledge, the Fokker DVII, in the 'Conditions of an Armistice With Germany', was the only single weapon ever mentioned in a treaty. For those who do not know, Germany was forced to hand over all of their Fokker DVIIs to the Entente powers, although in reality many were not. Thank you to a reader for showing me my error, it was not in the 'Treaty of Versailles', just the preliminary armistice conditions. There is a myth or fact, which we will get to, that the Fokker DVII could fly upward and actually hang on its propeller for a short moment. The authors discount the tale. However, that is not the end of the story. In Rhinebeck, N.Y. in the U.S. there is an aerodrome right out of World War I. They have aerial shows and even dogfights between the old birds. Some pilots and onlookers swear that, yes in fact, the DVII can hang on its propeller. I can see where people would ask the relevance of this maneuver, and think it was only useful in acrobatic shows. In actual fact, this would be a tremendous plus for the DVII in combat. When being trailed by an enemy plane, to be able to fly vertically for even the smallest of time would force your opponent to break off his attack, or risk going into a stall, due to the loss of airflow over the wings. The DVII could then turn and follow the opponent. The author, Tomasz J. Kowalski has written twenty-three books and 1500 articles on aviation. This is his ninth book published by Kagero. This edition is in the same format as others in Kagero's 'Legends of Aviation in 3D'. A history of the airplane. filled with World War I photographs, is followed by computerized 3D views of the entire plane. These views also show the plane without its fabric skin, much like a 3D view of the human body sans skin and muscle. There are four full pages of computerized views of the machine guns and ammo holders alone. 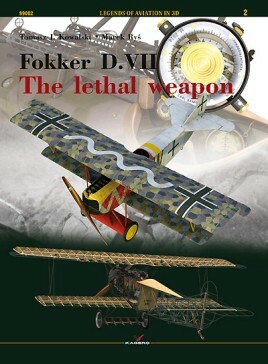 As mentioned, many nations after World War I received Fokker DVIIs. In the history section, even these planes are written about on a country by country basis. For the modeller, aviation historian, or technical spec lover these books by Kagero are the end all and be all, though this book is not only for them. The World War I or aviation history tyro will find this book easy to get into. One very interesting bit of history of World War I aviation that the book shows is that planes built in Germany during the war were not carbon copies. You can see very real differences in planes manufactured by different firms. This, along with all of the other parts of the book, shows that if you have any interest in World War I aviation, or just aviation history, it belongs on your shelf.